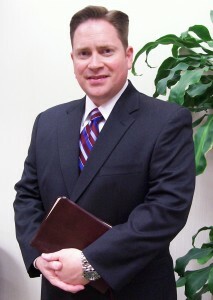 Pastor David Pauley is the Senior Pastor/Teaching Elder here at Grace Baptist Church in Lompoc. He graduated with his undergraduate degree in theology from Dallas Baptist University, majoring in Biblical Studies. Pastor David received his Masters in Theology from Southwestern Baptist Theological Seminary in 2005. He is currently working on his Doctorate at Master’s Seminary. David has been pastor of Grace Baptist Church of Lompoc since 2009 and is committed to the exhortations found in 2 Timothy 4:1-2 and 1 Peter 5:2, namely that the Word of God is to be preached in its entirety, without shame, in season and out of season with great patience and instruction. He believes that preaching is a sacred task, backed by serious study in the Scriptures and careful verse-by-verse exposition of the full council of Scripture. “I have the joy and privilege of pastoring the wonderful flock at Grace Baptist Church of Lompoc, California. I have been married to my wonderful, godly and lo vely bride, Kimberly, for over 20 years. We have seven children: Stephen, Matthew, Daniel, Elizabeth, Rachel, Nathaniel and Joshua. As a Christian and as a pastor I believe, trust, preach and confess that there is but one, true, living, eternal, unchanging, perfect, all powerful, omnipresent, holy, just, wise, gracious, merciful and loving God (one in being, three in person: Father, Son and Holy Spirit), and that He has made Himself and His will known through His perfect, inspired, inerrant and infallible Word – the Bible, and the Bible alone is our standard for all matters of salvation, life and godliness. I believe that there is but one way of salvation, by God’s grace alone, through faith alone in the perfect work of Christ alone.